JP and Michelle MacFadyen are dedicated to sustainable practices in their restaurant and to sharing the bounty of their bakery with others through local food donations to feed the hungry. By now we’re all familiar with the locavore ideal: buy food from local producers, family farms and businesses. In the pursuit of this ideal, sometimes people regard corporate franchises as not being local, family run, community oriented businesses. This is not always the case. The married owners of Great Harvest Bread Co. in Lafayette, La., have molded their corporate franchise into their own image, reflecting their values of care for the community they serve and the environment we all depend upon. JP says that they’ve taken to heart the Latin meaning of the word, “companion,” by breaking bread with others through their donations, instead of selling their day old bakery goods to customers at a reduced price. He explains their business philosophy to Ethical Foods and the care that he and his wife take when choosing green practices that support sustainability and reduce waste, an effort that has resulted in their franchise earning the first green certification for a restaurant in Louisiana from the Green Restaurant Association, a national nonprofit. You call your restaurant a “freedom franchise,” which you describe as having the freedom to customize your business so that it caters to the customers in your area. Is this an established franchise policy or something you decided to pursue on your own? “Great Harvest Bread Co. has always touted the ‘Freedom Franchise’ model. This means each store operates like its own neighborhood bakery with the ability to run the bakery as we—the owners—wish to do, only relying on the corporate personnel when desired. 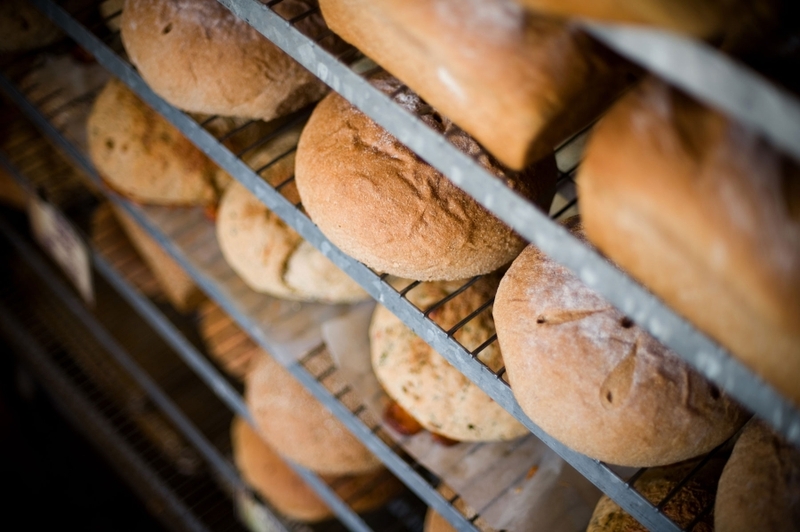 The last line of our mission statement (both for the franchise and our bakery) is: ‘Give generously to others.’ Donating day-old bread and sweets to our local soup kitchens instead of trying to sell it at a discount is our way of living out that piece of the mission statement. It is certainly not a policy that is mandated from the franchise, although there are many Great Harvest bakeries around the country that donate. Do you keep track of the amount of your donations made annually? What factors influence the amount of food that is donated? Are there specific actions you take to limit creating excess food in the first place, like using portion control or adjusting the schedule for food preparation? How do food donations complement your other actions that promote sustainability like recycling and using locally sourced produce? Yours is the first restaurant in Louisiana to obtain a certification from the Green Restaurant Association? Why did you choose this path? “There are a couple of reasons that we chose to obtain a certification from the Green Restaurant Association. First, we strongly believe that everyone needs to play a role in helping create a sustainable future, whether that is taking individual actions, steps taken within the household, or broader initiatives within a business or community. As business owners, we felt like we needed to really incorporate sustainable practices into our business. Visit the Great Harvest of Acadiana’s website. Find a Dine Green restaurant near you. Read more articles about sustainable restaurants.